Healthcare spending nationally grew slowly for the second successive year in 2010, bringing it in line with growth in the U.S. economy as a whole, according to the Department of Health and Human Services (HHS). Spending rose by 3.9 percent in 2010, to $2.6 trillion, while the GDP rose 4.2 percent, according to HHS, which published its findings in the journal Health Affairs. In 2009, spending increased nearly the same by 3.8 percent, but in contrast it’s growth rate was twice that by 7.6 percent in 2007. Spending increases frequently hit double digits in the 1980s and 1990s. While spending growth in general remained slow, premiums for people in private insurance plans grew faster for the first time in seven years than what was spent on their care, according to the Centers for Medicare and Medicaid Services (CMS). Premiums in 2010 rose 2.4 percent, slightly less than the 2.6 percent increase in 2009, although private health insurers’ spending on actual benefits rose only 1.6 percent in 2010, down from 3.7 percent in 2009. Healthcare represents 17.9 percent of the U.S. economy, the same proportion as in 2009, according to a government report. “Persistently high unemployment, continued loss of private health insurance coverage and increased cost sharing led some people to forgo care or seek less costly alternatives than they would have otherwise used,” the report said. The report showed that the federal government paid 29 percent of the nation’s healthcare bill in 2010, up from 23 percent in 2007. Some of that increase reflects a transitory increase in federal aid to states to enroll more uninsured people in Medicaid. The percentage of spending by private businesses and state and local governments fell. The recession played a large role in impacting spending, CMS officials said. Because fewer people were insured, and private insurers generally picked up less of the cost, patients went to the doctor and hospital less frequently. The answer may go beyond the recession. “The utilization slowdown is at least in part structural, and not just cyclically driven by the economy, and the adoption of higher cost sharing plan designs will result in some level of permanent slowdown in trend,” said Ana Gupte, a senior analyst at Sanford Bernstein, which conducts research for investors. “Premiums grew faster than benefits for the first time in seven years, and benefits grew at their slowest rate in the history of the accounts, according to Anne Martin, a CMS economist. Martin said this was because private health insurance companies lost enrollees as people were laid off, moved to cheaper health insurance plans as a result, cost-sharing increased. Additionally, spending on prescription drugs declined in 2010. Not only did individuals buy fewer drugs, but there were also more switches from brand to lower-cost generic medications. According to CMS, fewer new drugs came onto the market. The phasing in of the patient Protection and Affordable Care Act (ACT) which will expand insurance coverage to as many as 32 million people, will incur larger cost increases later in this decade. 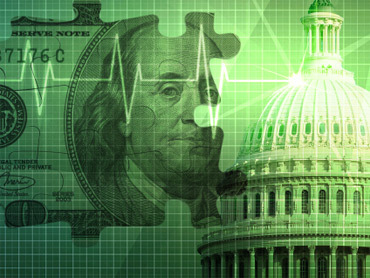 National health spending is expected to increase by 8.3 percent in 2014, when the most ambitious coverage expansions take effect, according to CMS projections. “The law will control the growth of healthcare spending through fraud prevention, better coordination of care, disease prevention and overhauling insurance markets,” DeParle said. Healthcare construction rose nearly 50 percent to $12.6 billion in 2010, an increase from the $8.5 billion reported in 2009. Many medical development experts are now saying that the industry has come back almost as strongly as prior to the recession. Healthcare assets remain strong because of the fundamentals of its existence; essentially, the growing and aging population. Additionally, consolidations have hit the industry hard, with successful mergers typically resulting in redevelopment or expansion plans. Healthcare construction spending grew more than 10 percent for seven years, and then stalled. The halt still represents an enhanced growth than almost any other construction market during the recession, which deepened as a result of the credit freeze that began in the fall of 2008. Throughout the slowdown, hospital construction spending increased nine percent when compared with the period before the credit freeze; spending for specialized medical office buildings fell 17 percent. The slowdown in medical office spending corresponds to trends in other developed financed sectors, although the slowdown began later and has been less severe. Reduced income and unhealthy balance sheets caused some developers to lose access to credit. Others lost credit because lenders had concerns about cash flow coming from new capacity in a depressed economy. Healthcare construction spending should return to a 10 percent annual growth rate in 2011, a reflection of the usual cyclical surge that follows a recession. The rebound for hospital construction spending is a result of delayed stimulus plan funding and the resumption of work that was put on hold while healthcare reform was debated in Washington, D.C. The Urban Land Institute (ULI) has recognized that the growing demand for medical services – needed to treat aging baby boomers, combined with shifts in approaches to treatments to curb rising costs — will significantly increase the need for new and redeveloped medical office buildings. According to a new report, The Outlook for Health Care, published by the ULI and Seavest Inc., the increase in investment and development to fill that demand will strengthen the healthcare industry’s role as an economic development engine throughout the United States. The Outlook for Health Care, written by economist Gary Shilling, discusses long-term trends and drivers contributing to the demand for more medical facilities and all-new healthcare facility products such as wellness centers. The reason is that baby boomers are living longer and need a greater range of services; technology changes have required retrofits or new development; growth in the number of insured Americans under the healthcare reform legislation; ongoing growth in healthcare-related jobs; the shift toward outpatient treatment facilities; and growth in the number of physicians employed by hospitals. Shilling discussed the report at a forum, “Anchor Institutions as Catalysts for Urban Investments,” hosted by ULI in Washington, D.C. “Both demand and supply factors point to rapid growth in spending on medical services and medical office buildings for many years. Medical care will continue to grow rapidly and steadily for two basic reasons – it is an essential human service, and it is heavily supported by the government,” Shilling said. I Just Graduated in Nursing. Where’s My Job? This spring’s class of nursing school graduates are running into an unexpected roadblock. The dream jobs that they thought would be waiting for them are hard to find. According to Rhys Gibson, “I mean I thought I was the cat’s meow and everything, because I’m an African-American guy coming out of here – I was waiting for the red carpet, I had the grades, had the experience, to an extent but not the practical experience as a nurse working on the floor. There isn’t a whole lot of money, even on my unit, I was lucky enough to make it in when I did because there hasn’t been another RN1 since and that was December ’09 when I got that job offer.” Gibson has applied for hundreds of jobs and finally founded a job as a nurse on a geriatric psychiatry ward at Rush University Medical Center. He is just one of thousands of people who entered nursing schools in Illinois in recent years, many in response to a drumbeat of news about a looming nurse shortage. According to Cathy Grossi of the Illinois Hospital Association, “There’s been a concerted effort led by the Illinois Center for Nursing to expand the capacity of the educational programming across Illinois to accommodate student interest for nursing education. So we’ve increased capacity around the state about 25 percent. That’s since 2006. But then the recession hit in 2007. And while it’s officially been over since 2009, the effects have been deep and long-lasting, even in healthcare – one of the brighter growth areas of the economy. We are now experiencing an increase in the number of graduates coupled with the time temporarily where there’s probably not as much opportunity as there was in the past.” According to Grossi, nurse vacancies at Illinois hospitals fell by more than half from 2008 to 2010. Although the nursing shortage has eased slightly for the time being, it is not going away. The recession brought a temporary reprieve because nurses who were close to retirement have seen their 401(k) portfolios decline. As a result, they are postponing retirement a few more years until the economy — and their portfolios — recover. Other nurses have seen their spouses or partners laid off and so have increased their hours to make ends. Some who left the profession to care for children or for other reasons have started working again to pay the bills. Additionally, many hospitals are not hiring. The recession brought hiring freezes to healthcare facilities, and many are still in effect. Help wanted ads for healthcare professionals dropped by 18,400 listings in July of 2010, even as the overall economy saw a modest increase of 139,200 in online job listings. Even so, healthcare remains one of the economy’s healthiest industries. On April 1, 2011, the Bureau of Labor Statistics (BLS) reported that the healthcare sector is growing, despite significant job losses in recent months in nearly all major industries. Hospitals, long-term care facilities, and other ambulatory care settings added 37,000 new jobs in March 2011, the largest monthly increase recorded by any sector. As the largest segment of the healthcare workforce, registered nurses will be recruited to fill many of these new positions. The BLS confirms that 283,000 jobs have been added in the healthcare sector in the last 12 months. The nursing shortage will regain momentum because of the impending baby boom retirement crisis. When you consider that the majority of registered nurses are over the age of 55, and that they will soon be retiring as well, the terms ‘crisis’ and ‘nursing shortage’ will become even more significant in coming few years. The nursing shortage is expected to also be influenced by the fact that nursing jobs will grow by 22 percent from 2008 to 2018, according to the BLS. Add in the fact that the nursing work force is aging and nursing schools aren’t graduating nearly enough nurses to fill the healthcare industry’s requirements, and the growing nursing shortage can be described as a “perfect storm”. “Moving into the future, we see a very large shortage of nurses, about 300,000,” said Peter Buerhaus, a nurse and health-care economist and a professor at Vanderbilt University. “That number does not account for the demand created by reform. That’s a knockout number. It knocks the system down. It stops it. I think the big story is…the future of nursing is dominated by aging baby-boomer nurses who are going to retire, and we are looking at massive shortages,” Buerhaus said. Americans’ healthcare spending grew by just four percent in 2009 (the last year for which statistics are available), the smallest annual increase in 50 years. This suggests that Americans did not seek healthcare because of lost jobs and a lack of healthcare insurance due to the recession. At the same time, healthcare insurance premiums increased at a faster pace than in 2008. Additionally ,the number of Americans with coverage fell by 6.3 million. Out-of-pocket spending on healthcare showed a slight increase. Medicaid spending rose sharply by nine percent, compared with less than five percent in 2008. This is a result of more people qualifying for Medicaid, again because of the recession. The statistics, released by the Department of Health and Human Services (HHS), are a sign that the recession left a deep imprint on healthcare in America – far worse than other recent recessions. “Job losses caused many people to lose employer-sponsored health insurance and, in some cases, to forgo health-care services they could not afford,” according to economists and statisticians at HHS’s Centers for Medicare and Medicaid Services. The report, which has been compiled by the government annually since 1960, is the most recent snapshot of spending across the healthcare system. Healthcare spending in the United States totaled $2.5 trillion in 2009, adding up to an average of $8,068 per person. The four percent rise recorded in 2009 compares with more than six percent in 2007, eight percent in 2005 and double-digit increases in 1990 and 1980. Even with the slowdown in spending, healthcare spending still comprised 17.6 percent of the GDP in 2009. Although healthcare has long been perceived as a recession-proof industry, the pace of employment growth has slowed, with just 17,000 jobs added monthly during January, February and March for a net gain of 51,000 new positions. That’s less than half the 2008 numbers, although hiring is likely to improve later this year because of pent-up demand. More than 16 million Americans – one in eight – work in healthcare. Employment in the industry has grown by 500,000 since December of 2007, a time when 5.1 million jobs vanished from the overall economy. Even the world-renowned Mayo Clinic, which employs 35,000 people, is feeling the pinch. The destination hospital has frozen salaries for physicians and senior administrators, reduced travel and overtime expenses and cut 2009 capital spending by $150 million. Standard & Poor’s downgraded Mayo’s debt in March, citing the institution’s large, unfunded pension liability and break-even operating margins. As 78 million baby boomers march towards retirement and old age, the need for healthcare professionals will only grow. The current slowdown in job growth is a temporary blip on the healthcare radar. Americans spent an average of $7,681 per person on healthcare during 2008, just a 3.5 percent rise over the previous year – the slowest growth rate in 48 years. According to a report issued by the Department of Health and Human Services, healthcare spending totaled $2.3 trillion in 2008 and accounted for 16.2 percent of the GDP. The culprit is the recession, which achieved what a generation of public officials attempted without success. Federal officials said the slowdown in health spending resulted from the soft economy, people delaying elective procedures, for example, and did not cite any factors that will alter the long-term outlook for continued increases as baby boomers age and physicians rely more on new technologies to treat patients. In other findings, the report noted that “private health insurance premiums and benefits grew in 2008 at their slowest rate since 1967, 3.1 percent and 3.9 percent respectively.” The slowdown reflects a drop in the number of Americans with private health insurance. That fell to 195.4 million in 2008, compared with 196.4 percent in 2007.